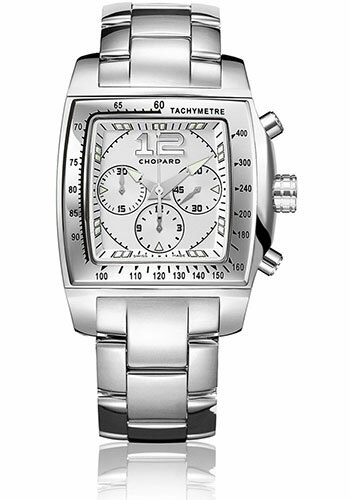 39.75mm x 35mm stainless steel case, black dial, automatic self-winding movement with chronograph function, approximately 40 hours of power reserve stainless steel bracelet. Water resistant to 30 meters. 39.75mm x 35mm 18K rose gold case, black dial, automatic self-winding movement with chronograph function, approximately 40 hours of power reserve. Water resistant to 30 meters. 39.75mm x 35mm stainless steel case, pink mother of pearl dial, automatic self-winding movement with chronograph function, approximately 40 hours of power reserve, leather strap. Water resistant to 30 meters. 39.75mm x 35mm 18K rose gold case set with diamonds, black dial, automatic self-winding movement with chronograph function, approximately 40 hours of power reserve. Water resistant to 30 meters. 39.75mm x 35mm stainless steel and 18K white gold case set with diamonds, black dial, automatic self-winding movement with chronograph function, approximately 40 hours of power reserve, leather strap. Water resistant to 30 meters.